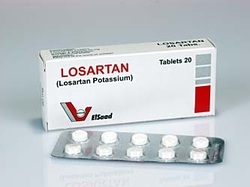 Angiotensin receptor blocker such as losartan, candensartan and valsartan are useful in treating patient with congestive heart failure and hypertension. Angiotensin receptor blocker will act by binding and blocking angiotensin receptor. There will be an inhibition of the action of angiotensin II. Blockage of angiotensin II function may lead to vasodilation and reduction of aldosterone production. There will be a decrease in the retention of the salt and water. There will generally be a decrease in the effective circulating volume of the fluid in the body and decrease in the peripheral vascular resistance. Angiotensin receptor blocker may not cause any angioedema or coughing as angiotensin receptor blocker may not metabolize bradykinin. Common side effects may include hypotension, renal failure, proteinuria, rash, fetal renal damage ( teratogenic effects) and hyperkalemia.